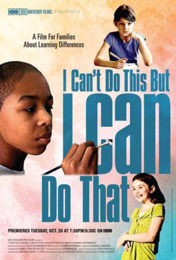 The HBO Family documentary I CAN’T DO THIS BUT I CAN DO THAT: A FILM FOR FAMILIES ABOUT LEARNING DIFFERENCES, an inspiring account of children with LDs who have discovered real abilities, and have learned to use their strengths to overcome their learning struggles. A learning difference affects how a person understands or uses language, spoken or written, and can also affect the ability to listen, think, speak, read, write, spell or do mathematical calculations. Some of the most common include dyslexia, dyscalculia, dysgraphia and auditory or visual processing disorders. While children with learning difficulties may struggle in specific areas, they often have talents that outshine those learning challenges. While these children are still grappling with the long-term realities of their learning differences, their resolve and tenacity prove they can overcome the challenges life places before them. Director and producer Ellen Goosenberg Kent has earned four Primetime Emmy® Awards for Outstanding Children’s Program, for the HBO specials “I Have Tourette’s But Tourette’s Doesn’t Have Me,” “Happy to Be Nappy and Other Stories of Me,” “How Do You Spell God?” and “Going, Going, Almost Gone! Animals in Danger.” She has also won two Peabody Awards and numerous other honors for excellence in non-fiction television and documentary film. Goosenberg Kent also directed and produced the critically acclaimed HBO documentaries “Alive Day Memories: Home from Iraq” and “Too Hot Not to Handle,” and a film for the multi-part HBO series “Addiction.” Her other HBO credits include “Middle School Confessions,” hosted by Samuel L. Jackson, and “Reading Your Heart Out,” which earned honors at film festivals in the U.S. and Canada. I CAN’T DO THIS BUT I CAN DO THAT: A FILM FOR FAMILIES ABOUT LEARNING DIFFERENCES is directed and produced by Ellen Goosenberg Kent; editor, Andrew Morreale; narrator, Michael D’Addario; co-producer, Nancy Stanton Talcott; associate producer, Quinn Bradlee; director of photography, Wolfgang Held; original music, Michael Bacon; supervising producer, Jacqueline Glover; executive producer, Sheila Nevins.